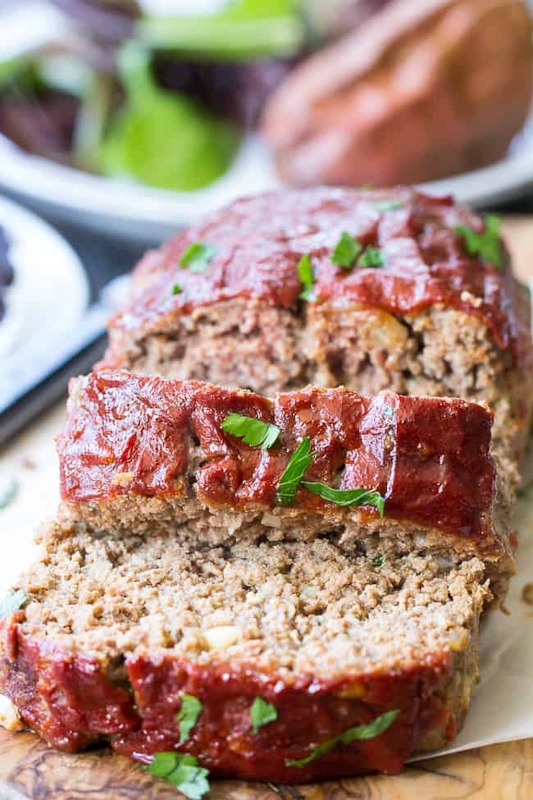 This Whole30 and Paleo meatloaf is packed with classic flavors and topped with Whole30 ketchup sweetened with dates! It’s the ultimate cozy comfort food that everyone will love. Gluten free grain free, dairy free, no added sugar. I’ve been holding onto this recipe entirely too long! I was waiting for the stars to align, and then force me to make dinner at 9am, you know, to take the pictures for the recipe. There is just something about making a meatloaf at 9am that, most days, just doesn’t seem as appealing as making cookies, muffins, or lemon curd tartlets. Anyway, along came a day when I found my motivation (AKA had zero time to make dinner in the evening), and so, here we are, talking Whole30 Paleo Meatloaf! I hope you’re excited, because despite my procrastination, this is a DANG good recipe. Not that I’m partial, it just happens to be a fact. I discovered my own version of Whole30 friendly ketchup during the January Whole30 that Adam and i completed. He actually isn’t much of a ketchup fan, but, I have to admit, I like to dip almost anything in it. Not ashamed at all, it’s delicious! The meatloaf itself is very straightforward, and, what I would consider to be a “classic” style meatloaf. I know from reading the internet that there are about 10,000 versions of “classic” anything, so all I can say is this is my personal classic. The recipe is in our weekly rotation (okay fine, bi-weekly, only because it takes an hour to bake!) and my kids somehow, by some miracle of meal creation, do not complain about the onions or garlic “pieces.” All I can make of it is that the meatloaf is good enough for them to overlook the serious matter of the invasion of chopped onions. How many recipes can we really say that for, mommas?! 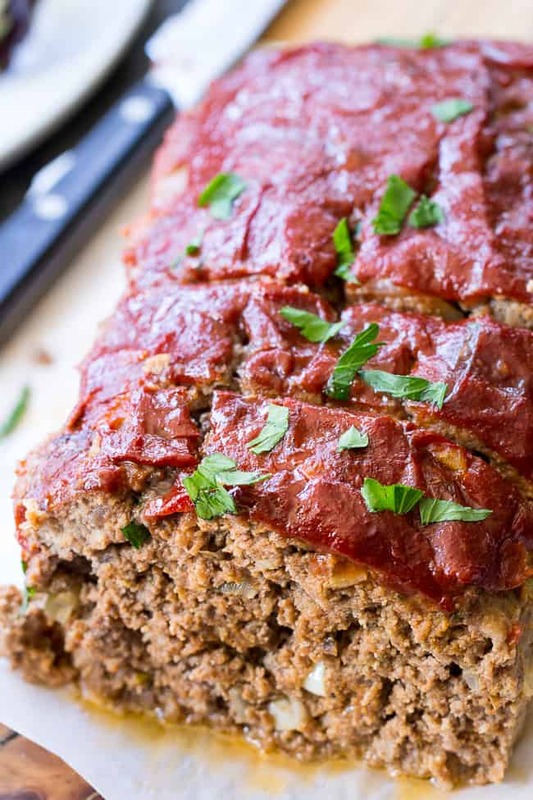 One more highly desirable quality of this paleo meatloaf? It’s perfect for leftovers! Heck, you can even make & bake the entire thing the day before (or at 9am if you’re like me) and it reheats just fine. No dryness, possibly thanks to those yummy onions and garlic which you’ll sauté in ghee to get them extra flavorful. The 85% lean ground beef definitely doesn’t hurt either! I get mine from U.S. Wellness Meats, but you can typically find 80-85% lean grass fed ground beef now at most grocery stores. 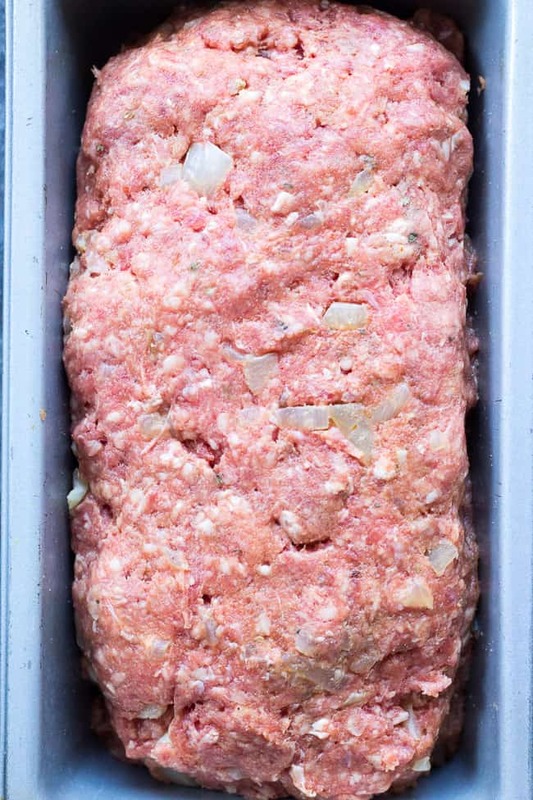 It’s time to make this meatloaf – are you with me? I hope you and your family love this one as much as we do! Let’s cook! 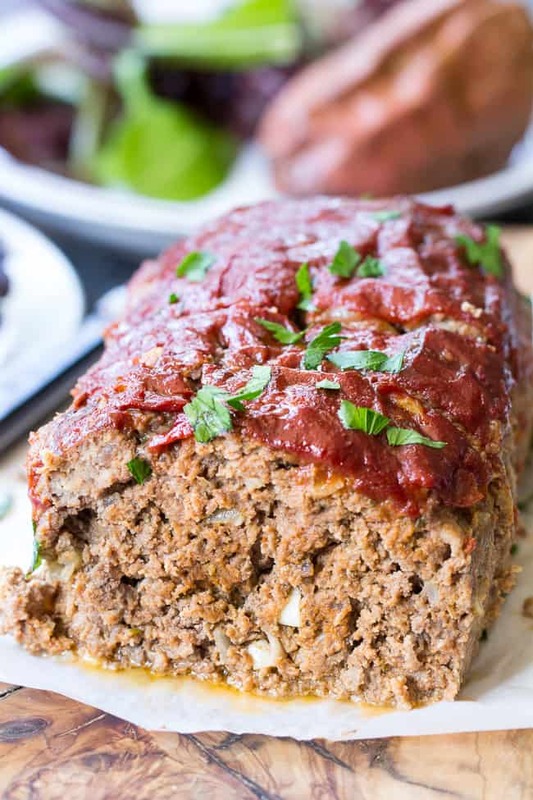 This Whole30 and Paleo meatloaf is packed with classic flavors and topped with Whole30 ketchup sweetened with dates! It's the ultimate cozy comfort food that everyone will love. Grain free, dairy free, no added sugar. In a food processor or high speed blender, process/blend all ingredients on high speed until pureed, scraping the sides to incorporate all ingredients evenly. Store in a sealed jar in the refrigerator until ready to use, leftovers can be refrigerated for 1-2 weeks. In a medium skillet, sauté the onions in the 2 Tbsp ghee (or other cooking fat) until soft, add the garlic, sprinkle with a tiny bit of sea salt and continue to cook, stirring, for about one minute, then remove from heat. In a large bowl, combine the beef, eggs, almond flour, 3 Tbsp ketchup, cooked onion and garlic with ghee, salt, mustard, Italian seasoning and black pepper. Mix with your hands until well incorporated but try not to over-mix, since this will toughen the meat. Allow the loaf to rest for 10 minutes or so, then slice and serve, garnished with chopped parsley if desired. Leftovers can be stored in the refrigerator in a sealed container for up to 4 days. Enjoy! Want more Whole30 & Paleo dinner ideas? Try one of these! What’s your favorite Paleo friendly comfort food/meal? Note: This post contains Amazon affiliate links. This means that if you click on a link and make a purchase, I will receive a small commission at no cost to you. Thank you for supporting Paleo Running Momma! Hmmm… I’m not sure it’s Paleo friendly, but my favorite comfort food is probably mashed potatoes. 🙂 I also really love . . . roast and veggies or roast chicken and veggies. This meatloaf is so pretty; I love how you photographed it. It sounds really delicious. You can make ’em paleo friendly for sure 🙂 Thanks Emily! Can you believe I have never had meet loaf? Not part of my family tradition I guess. I’m pretty sure I would like it though and it would be perfect to bring to work. Comfort food? crispy sweet potato slices topped with spicy taco meet, avocado and salsa! Mium! Thank you, Michelle!! My kiddos are in love!! And the ketchup, they think is fabulous!! 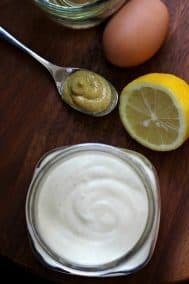 A wonderful go to recipe! 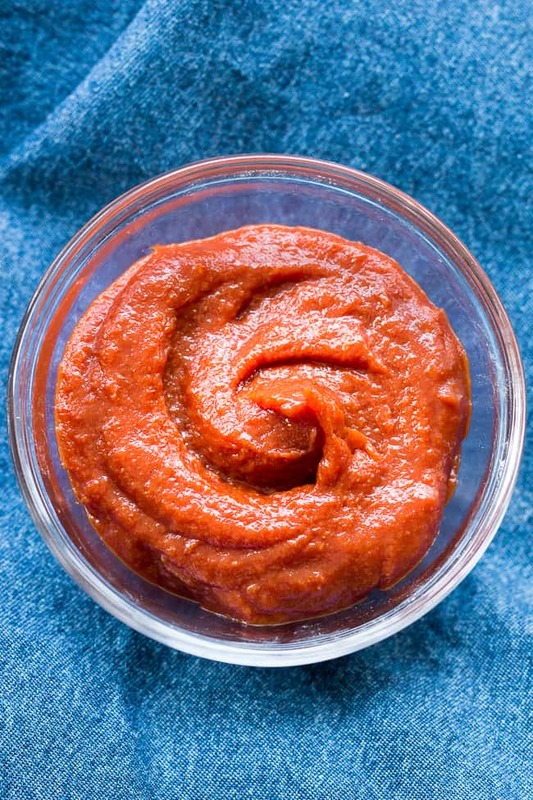 Is the ketchup really whole30 since the tomato paste you recommend has sugar in it? I’m only on day 2 of my whole30 and want to stay compliant. Thanks! The ingredients in the tomato paste are just tomato paste and citric acid. Which brand are you looking at? In any case the tomato paste you choose should not contain added sugar to be compliant. The dates will sweeten the ketchup to keep it Whole30. Hope this helps! Just made the meatloaf tonight and it was fabulous and so was the ketchup. I have mine in the oven right now! So happy you have a whole30 recipe section. I did the whole30 starting Feb 3 after the birth of my daughter and lost 50 lbs. After going off and seeing how food affects my stomach I’m back on and looking for some new food ideas! Thank you for this one! My meatloaf is in the oven right now- I substituted beef for ground turkey. The ketchup was amazing! I’ll never use the other stuff again. Thanks for sharing this recipe. My kitchen smells wonderful-can’t wait to eat the meatloaf! I have no doubt it’s going to be delicious. Do you have to use almond flour or can you substitute a gluten free baking flour? Can you use one pound beef and 1 pound ground pork? We really enjoyed the meatloaf! My husband eats Paleo and I’ve been looking for new dinner inspiration. We’re going to try your sausage pizza sweet potatoes this week, too! Thanks! Haven’t tried it so not sure how it would taste reheated. Pro-tip…pack your meatloaf mixture into muffin tins and cut baking time in half or less! So happy you liked it – woohoo! I have never been one to leave reviews for recipes and I have been an avid home cook for years. After starting my Whole30, I really feel an urge to let others know when recipes are great, because it’s normally a hit or miss. This was SO good. Easy to make, filling and delicious! Definitely adding to my rotation of recipes. So happy you liked it, yay! The only flour I can find in my store is a blend of almond, arrowroot starch, coconut flour and tapioca flour. Can I still make this meatloaf with that? I’m sure you could, however you’d probably need a different amount based on the proportions in the blend. Try adding 1 or 2 tbsp less and see how it goes to avoid an overly dry loaf. My son has nut allergy. So I was wondering if I could substitute almond flout with coconut flour? Coconut flour is much more dense so the same amount would really dry it out. Cassava or arrowroot might be better options, when in doubt add less. Ok, I thought the bacon wrapped tenderloin was mind blowing but after making this I’m torn. This is the first time I’ve ever written a review but I just had to let you know how much I love this meatloaf and Whole30 compliant ketchup. Thank you for your amazing recipes. Your recipes have made my Whole30 journey really enjoyable. Kinda sad there’s only 12 days left!! How long do you soak the dates in hot water for? Just until they’re soft enough to blend, a couple of minutes usually. Made this last week and now we can’t wait to make it again. 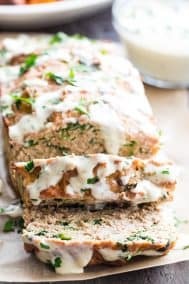 My favorite meatloaf recipe to date. I exchanged 1/2 pound of beef for pork and being out of Italian seasoning I made some minus the marjoram which I didn’t have. It was SOOOO good. My husband starting telling the family about it, and he grew up hating meatloaf. 🙂 Thank you for an amazing recipe. That sounds great – I’m thrilled you guys liked it! I made this meatloaf tonight. It was delicious, but completely fell apart. Any suggestions? It was 170 degrees when it came out of the oven, and rested 10 minutes. The Whole30 ketchup is wonderful and makes the meatloaf. Not sure why it fell apart! Maybe the almond flour? Not sure. Glad you enjoyed the flavor and the ketchup though! Is the mustard in the recipe dry or prepared? Prepared mustard, just make sure it’s Whole30 compliant if you need it to be. I made this for dinner tonight with cauliflower mashed potatoes and spinach with mushrooms. All I can tell you is MAKE THIS!!! It was fantastic! The combination of flavors was the best meatloaf I have ever had. It is worth the effort for the ketchup. So happy you liked it!! This turned out so good! The ketchup was the perfect balance of sweet & savory. I used ground turkey instead and it came out great. Thanks! This was a wonderful meatloaf recipe! It got rave reviews from a potluck I took it to. I added Whole30 bacon and used Whole30 approved ketchup I had bought. Thanks for sharing the recipe! Absolutely delicious! Moist, flavorful, and healthy. My family loved it! I forgot to mention I doubled the eggs and used “Tessemae’s” organic ketchup (Whole30 compliant), as it was already in the fridge. Ok. Thanks. I was looking for something under 100. ? thanks anyway. This is one of my new fav’s. Even my picky kids and hubby loved it. This one is going to be a regular in our lineup. Tasty recipe. My non-healthy eating husband really liked it too. Great meatloaf and I also used some leftover to make freezer meatballs. My non-Whole 30 husband liked it too; yea! I love the Whole 30 ketchup! Excellent ketchup flavor that I’ve missed having given up ketchup years ago due to sugar content. Thanks. About to make this for second time. So thrilled you liked it! Just wondering if you have tried to make this in the instant pot. I made this for whole 30 and it’s incredible! It’s so moist and flavorful. Loved the katchup. So thrilled you enjoyed it! I’m not doing whole30 so I just used an organic ketchup with very little sugar, and did 1 lb beef/1 lb pork. Omg it’s delicious! I ate a piece almost straight out of the oven and burned my mouth – waited 2 minutes and tried again haha. Wow! we do not care for meatloaf in our house, but this was a HUGE HIT! I’m honestly shocked and how delicious it is. It will definitely be a regular in our W30 rotation! Oh awesome to hear that! Can you sub coconut flour for almond flour? What would the measurement be? Typically you only need about 1/4-1/3 of the amount of coconut flour when subbing for almond. It’s so much more dense and absorptive. If you want to use arrowroot or tapioca those will sub in more easily, just 1 Tbsp less I’d say. This is delicious. My whole family loved it! I ended up adding at least 1/4 cup of water to the ketchup to get it thin enough to blend the dates in. We will definitely make this again and again! It was amazing! The original is good but the alterations added a little more depth and my boyfriend gave me the ultimate compliment: it was better than his mom’s! Delish! Moist and flavorful . Home run. I used 1lb grass fed beef and 1lb good ground pork. Loved the homemade ketchup too! You always have the best recipes. Thank you. This is a great recipe! So yummy! I used cashew flour instead of almond flour because someone joining us had an almond allergy. Just tried it. Wow. I love the Ketchup recipe and cooking the onions in the ghee. Delicious. Definitely best I have tasted so far. I’m so happy I found this recipe! I made it tonight (I used Primal Kitchen’s unsweetened ketchup since I had it on hand) and it was SO. GOOD. My kids devoured it. It definitely made enough for two dinners (there are three of us) and my kids are excited they get to eat it again this week! Thank you for being awesome! Turned out sooooo good! I used a little less than 1/3 cup of cassava flour instead of almond flour and tried one other commenter’s suggestion of cooking the meatloaf in muffin tins. Seriously, this felt so delicious and decadent it was hard to remember that it was actually good for me! Thanks so much for the bomb recipe! The author is a total narcissist….she should stop talking about herself like she should be worshipped by all of the readers, and just give the damn recipe….by the time I got to that part I was nauseated…going to a different site for a recipe…. This recipe was delicious! Thank you for the great whole30 ketchup recipe too! I added other veggies to the meatloaf that I had on hand: red bell pepper, celery, jalapeno and baby spinach. Thank you for this delicious recipe! I make lunch for 40 on Wednesdays and there are always a few on whole30 or eating low carb so when I found your recipe with such rave reviews I decided to make it and I’m glad I did! Everyone loved it! Made this the other day and my family loved it! So much I’m making it again tonight for the second time this week. Forget that it’s Whole30, I’ll be making this anytime. Probably the best meatloaf recipe I’ve ever had. I used spicy mustard instead of regular and used a mix of chuck, pork and regular ground beef. If I make this using only one pound of ground beef-do I lessen the cooking time? 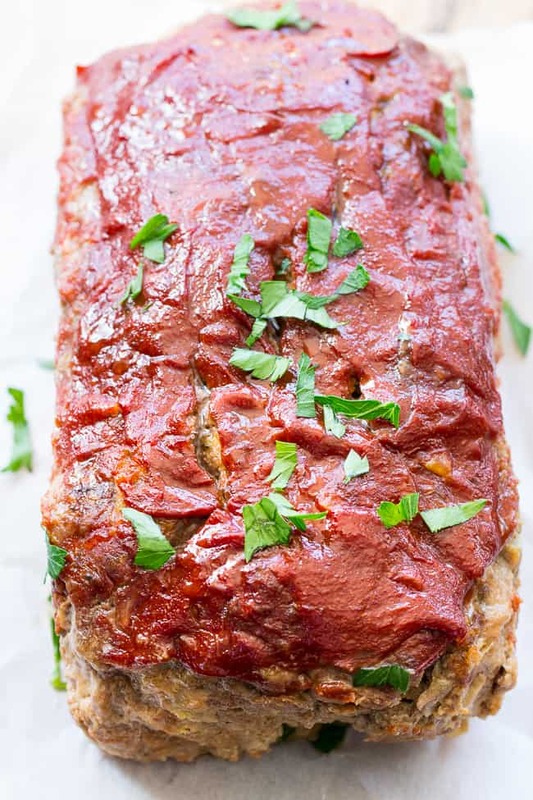 Delicious meatloaf and the best homemade paleo ketchup recipe ever! The apple cider vinegar was a little strong for me so I substituted one TB with a TB of lemon juice. It was perfect! Another great recipe! Thanks for posting this, you saved dinner again. 🙂 My only change is I used a store bought honey-sweetened ketchup, and I added bacon to the top like someone mentioned, and it’s my new favorite! I printed it so I could add it to my files. I’m not one to leave comments (usually a lurker) but this meatloaf was amazing. My extremely picky eater husband loved it. And he didn’t even complain that it was healthy! Thanks for never failing to come up with delicious recipes! Do you have the nutrition information? This was amazing! I never told my family how I made it until after dinner when they couldn’t stop raving about how good it was. It was truly DELICIOUS! We love this recipe! It is so moist and flavorful, also a hit with our 21 month old son. We have made it for people who do not eat Paleo and the also love it. 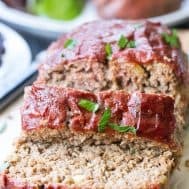 My hubby and I were craving meatloaf and I’m so glad I discovered this delicious low carb meatloaf. Not only didn’t my hubby enjoy it, my kids did too! Thanks!! This was great! I left out the almond flour (because I forgot it) and I added a diced green bell pepper. Will definitely be making again!